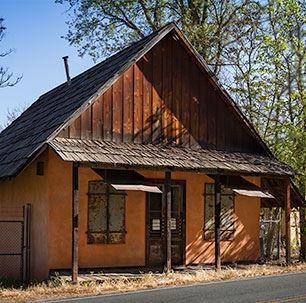 Fiddletown’s Chew Kee Store is unique in California, a time capsule that reflects 100 years of continuous habitation by Chinese immigrants and residents. Everything in the store is authentic, reflecting the daily life and work of its various inhabitants: herb doctor Yee Fung Cheung, who founded the store in the mid-1850s; merchant-gambler Chew Kee and wife Sigh Choy; and their adopted son “Jimmie” Chow (Fong Chow Yow) who was born and died in Fiddletown – much loved by the community and the only Chinese person buried in its public cemetery. Each resident left behind objects that tell the story of Chinese culture transplanted in emergent California. The building was constructed by Chinese workers using the traditional Chinese technique of rammed earth, resulting in thick mud-packed walls that cool the structure during hot summer days. The store served as a business and home for its residents. Besides the spacious commercial room at the front, private living space includes bedrooms, an office, and two add-on kitchens – much of the interior is built with hand-hewn wood. All furnishings and artifacts in the rooms are original. The Chew Kee Store is open to the public as a museum operated by the Fiddletown Preservation Society, April-October, on Saturdays only from noon-4:00p.m and by appointment. 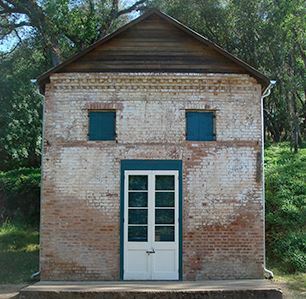 This building was constructed in the mid-1850s or early 1860s by Americans who owned property in Fiddletown’s Chinatown. Constructed of brick, it must have been among the first permanent structures in Fiddletown. For many years during the 19th century, it was owned by the merchant Foo Kee, perhaps the wealthiest Chinese person in Fiddletown. Foo Kee obtained a deed to the property in 1871. He owned two other parcels, one immediately south of this building and the other to the east adjacent to the seasonal creek. These properties were in the heart of Fiddletown’s Chinese district, and Foo Kee had the largest land holdings among the Chinese inhabitants. Also known as the Foo Kee Store, the structure served as a Chinese merchandise store, containing wares ranging from preserved Chinese food ingredients to clothing and mining supplies. Its upstairs loft could be used for storage. It is one of four still-standing Chinese-related buildings in Fiddletown, all of which are significant for being part of an early California Chinatown. Exterior reconstruction and weatherproofing was completed in 2008. The interior is vacant, awaiting restoration. The building is open for special events only. The building was used as a gambling house in the 19th century and owned for many years by Yee Fung, probably the same man who established the Chinese herb store across the street. There was much activity between the two buildings, especially when the merchant Chew Kee took over the herb store. He was one of the shareholders in 1884, when the gambling house was established as Fook Tai Chong or the Fortune Peaceful Gambling House. Chew Kee Store resident “Jimmie” Chow recalled “sing-song” girls occupying the loft. Their music could be heard throughout Chinatown. This structure was most likely built by Chinese workers in the 1850s to early 1860s. The rear wall consists of the bare earth and rock of the steeply sloping hillside to the south. Its brick facing abuts the stone walls on the sides. The lack of windows, except for a small window in front, made it suitable for use as a gambling house. As with many gold rush buildings, iron doors and the window shutter protected the interior from fire. The Gambling House underwent exterior restoration in 2008 to stabilize and weatherproof the structure. The interior is currently bare awaiting funding to make this into a museum. The building is open only at special events. Fiddletown’s one-room schoolhouse was constructed in 1862, replacing the first schoolhouse built in the mid-1850s. When the town's name was changed to Oleta in 1878, Fiddletown School became known as Oleta School―and many former students still refer to it by that name. The name reverted to Fiddletown School after the town name changed again in 1932. Generations of some families attended the school. Brothers and sisters sat together in the single classroom, which covered grades one through eight. 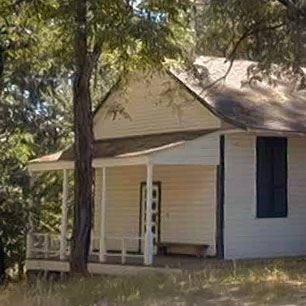 For 93 years, children were educated in this modest schoolhouse. It was split into two classrooms in 1946-7. In 1955 the school was closed when area schools were consolidated and relocated to Plymouth. Similar to other schoolhouses in the county, the Fiddletown Schoolhouse consists of wood frame construction with clapboard siding, a porch and a belfry on top. The building is owned by the Fiddletown Preservation Society. Volunteers have dedicated many hours to restoring its interior. Maintenance is ongoing, bolstered by funds raised in annual Schoolhouse Breakfasts for the community. 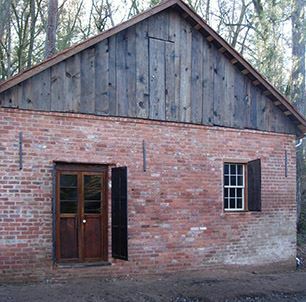 The schoolhouse added a septic system in 2014 and the following year, its foundation was rebuilt to stabilize the building. It is now available for public use.